Common side effects of Zantac are generally manageable and may include nausea, diarrhea, stomach pain and headache. Side effects of ranitidine medications such as Zantac are not generally disruptive and may be treated with an adjustment to your dosage. If you experience any serious side effects, however, you should contact your doctor. Dangerous side effects include hallucinations, depression, abnormal heart rhythms and signs of liver damage. These side effects are typically mild. However, if these symptoms become severe or disruptive to your lifestyle, you should consult your doctor. Severe side effects may be a sign of a more dangerous underlying condition. Some individuals are allergic to Zantac (ranitidine). If you are allergic to other H2 histamine blockers such as famotidine (Pepcid) or cimetidine you may be allergic to Zantac as well. If you experience any of the following side effects you may be having an allergic reaction. In the event of a allergic reaction, you should contact your healthcare provider immediately. Zantac has not been thoroughly studied in pregnant and breastfeeding women. This makes Zantac a Category B pregnancy medication. These treatments are generally considered to be safe. However, you should discuss the pros and cons of this or any medication with your doctor in regards to your pregnancy. Depression is a possible side effect of Zantac. Though this occurs rarely, it is important to be aware of the symptoms of depression. If you believe you are experiencing depression as a side effect, you should contact your healthcare professional immediately. This problem may be resolved with an adjustment to your dosage or another medication. Patients may also experience some physical side effects that are actually a sign of depression. Persistent headaches, stomach problems and pain can be a symptom of depression. If these ailments do not respond to normal treatments and are accompanied by any of the above, you should consult your doctor about diagnosing and dealing with depression. Dizziness is one of the more common side effects associated with Zantac. You should not drive or operate dangerous machinery while taking this medication until you are familiar with how it affects you. If you experience dizziness or disorientation of any kind, discuss it with your doctor to determine a safe method for dealing with these side effects. You should also limit your intake of alcoholic beverages while taking Zantac to avoid worsening dizziness and disorientation. 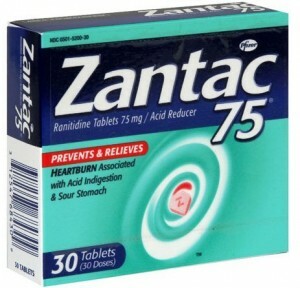 Zantac (ranitidine) can be very effective treatments for managing excess stomach acid. These medications can be taken briefly to heal damage from too much acid or on a long-term basis to control painful stomach acid. As with any medication, if you happen to experience side effects, you should consult your doctor. You may be able to resolve these issues without stopping the medication entirely by simply adjusting the dosage or taking additional drugs to treat the issues you are dealing with.